If you’re searching for evidence of musical destiny then there is surely no finer example than The Milk Carton Kids. Kenneth Pattengale and Joey Ryan experienced largely low key careers in the industry prior to teaming up in 2011. Not only did they find each other, but landed on an incredible innate understanding of how to blend the beauty of the acoustic guitar and the fragile voice. It is reasonably simple to understand the evolution of the sibling harmony, less so when not bound by genetic ties. From the opening song of the duo’s show in London this evening, it was obviously apparent that we were in the midst of a special partnership, capable of stunning an audience with a near flawless single voice and a brace of complementing guitars. While widespread acclaim has been heaped on The Milk Carton Kids including Grammy recognition back in the US, not too much attention has been paid to the UK market. Two relatively minor albums have been followed by a couple of more successful releases with the latest of these, MONTERREY, being issued since the pair last played shows on UK soil. Although this was a repeat visit to the Union Capel, they apologised for the delay, while significantly noting that the audience size had grown from a quarter full to the sold out sign being dusted down. The next step is surely to expand out of London and this process will begin as the guys have been invited to join this year’s Transatlantic Sessions tour which plays large-sized halls across the country. It’s a toss up to decide whether the spectacular vocal harmony or guitar virtuosity is the duo’s redeeming feature. The latter is definitely ear catching especially as Kenneth’s extravagant picking perfectly complements the rhythmic consistency of Joey’s more subdued playing. Whereas you can hardly insert the breath of a whisper between the vocal harmonies, an individual stamp is made both on the playing and also the extensive inter-song banter. This is almost entirely the domain of Joey, formed of an incisive satirical wit, regularly bouncing off Kenneth and rambling into random subjects such as fatherhood, child birth and feline/canine homicide. Apologies but you had to be present to fully appreciate this, although it has to be said that the guys struck the ideal balance of optimising entertaining irreverent chat within a stage time spanning ninety minutes and containing approaching twenty songs. The evening’s material was drawn mainly from the latest album and its predecessor THE ASH AND THE CLAY. There were four exceptions to this starting with the humorously introduced ‘Charlie’ from their debut album RETROSPECT. From its follow up PROLOGUE we were treated to the excellent ‘Michigan’, ‘New York’ and ‘I Still Want a Little More’, before the proverbial curtain was drawn down with a typical Milk Carton Kids style makeover of Pink Floyd’s ‘Wish You Were Here’. 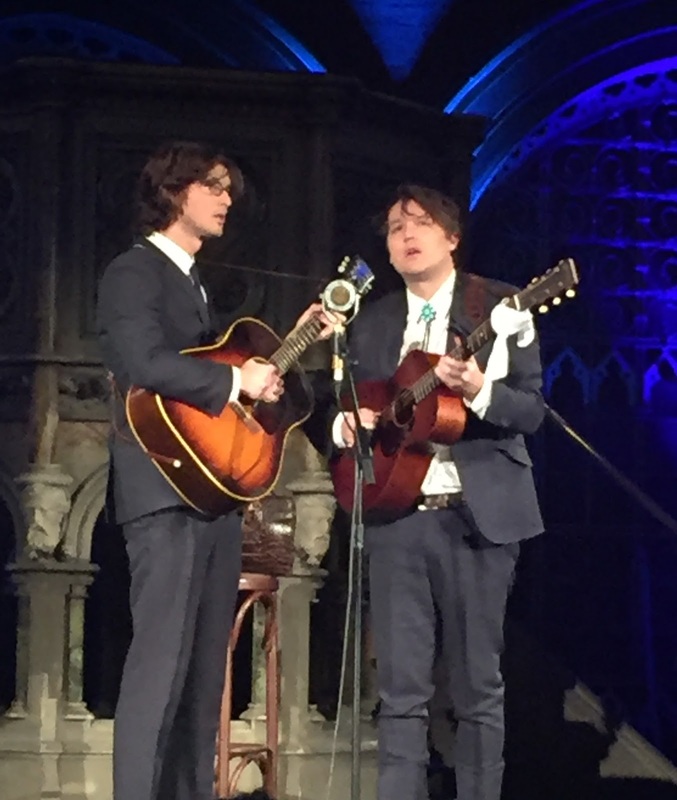 At this juncture, it is necessary to pay compliments to the awesome surroundings of the Union Chapel and a sonic atmosphere gift wrapped for two guys playing the most delicate of acoustic music through that iconic traditional single mic. This was a first visit to a highly recommended venue and no finer location to catch The Milk Carton Kids for also the first time. Anticipation in seeing them perform live grew tenfold following a cinema viewing of the ‘Another Day/Another Time’ concert documentary where the relevance of the duo’s role in the current popularity of the folk revival sound was splendidly shown. As if to kill the Simon and Garfunkel analogies which often frequent press coverage, Kenneth got in first on one of the few occasions he owned the mic between songs. Back to the songs, which thrilled the audience and enticed a couple of standing ovations, and leading the way was a couple of relatively up temp numbers in ‘Heaven’ and ‘Honey, Honey’. It is hard to argue against these being the evening highlights, although ‘Asheville Skies’, ‘Monterrey’ and ‘Snakes Eye’ push them to the limit. There is also a strong case to state that the actual songs are a mere backdrop to the aura and spellbinding atmosphere of being seduced by the sheer experience of listening The Milk Carton Kids live. There was no support for this show, but it is tricky for any other artist to make an impression when Kenneth and Joey are in full flow. With their impeccable timing and melting pot of folk music in its purest form, The Milk Carton Kids are a treasure to be nurtured and shared by the American roots music scene which has taken them to their hearts. Many more nights in the UK like the one experienced in the Union Chapel this evening will lead them to the wider world of international adoration.